We’d love to be able to ignore the battles swirling around and about the Trump presidency, but the overwhelming onslaught of charges and their potential to affect the future, not only of the United States, but allies and enemies alike make that impossible. President Trump is embarking on the first international journey of what is seen as a U-turn and a new era in international relations. We’ll hear the speeches and read the reports that will come from Saudi Arabia, Israel and the Vatican. The upshot is apparently meant to inform the Middle Eastern region and the world that the United States is through standing on the sidelines and allowing the most dangerous regimes on earth to threaten allies (particularly Israel), and that going forward both American interests and Israel’s interests will be defended. Apparently, President Trump believes that he can exploit his skills as a negotiator to bring peace to the Israeli-Palestinian conflict. Surely, he knows he’s not the first, and that such an outcome is beyond a long-shot. But every expectation is that he will revive the close relationship that the U. S. had with Israel prior to the Obama years, where the Muslim Brotherhood was defended and promoted, especially in Egypt. You’ll notice that Trump’s first stop is Saudi Arabia. Anyone planning a Middle Eastern tour knows you never go to Israel first. Most Arab countries won’t allow you entry if you have an Israeli stamp in your passport, and that undoubtedly includes Saudi Arabia. For Trump to have gone to Israel first would have been a faux-pas of the highest order. Nevertheless, Saudi Arabia and Israel have a common concern and that is Iran. Israel wants Iran’s behavior linked to whatever is left of Obama’s “nuclear deal,” and for economic sanctions to be implemented in the event of any more ballistic missile tests. Prime Minister Netanyahu has pointed out that the missiles Iran has been testing are scrawled with the words, “Israel must be destroyed,” and the like. Iran has made no secret of its intention to wipe Israel off the face of the map, or the fact that “Death to America” is a national goal. It seems that President Trump may have backed away from his campaign promise to move the American Embassy from Tel Aviv to Jerusalem, much to the consternation of many supporters. He may have been convinced that such a move will cause too much of an uproar throughout the Muslim world, and make other accomplishments impossible. The most difficult of those would be an Israeli/ “Palestinian” peace agreement. 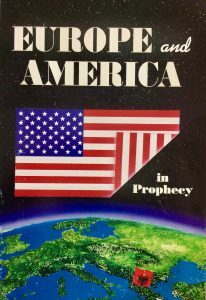 Knowing what we do about Bible prophecy, you have to wonder if that’s even a good idea. “When they say, ‘Peace and Safety’… Look out! Sadly, President Trump intends to visit the Vatican to make nice with the “humble” pontiff. It’s a sad reality that every American president thinks kissing up to the Pope is an obligatory duty. But it’s pretty clear that this pope and this president don’t see eye to eye on any important subject. This pope can reasonably be blamed for setting off the refugee crisis that will blight Europe to the end of time, assuring a steady stream of terrorist atrocities. Maybe some pretense of common ground will emerge, and that will be a surprise. The saga continues, and we all must be wondering if there will ever be an end to it. Judging from the obvious commitment of the mainstream media to bring a timely end to the Trump presidency, it probably never will end. You don’t need to read it here to know that there is a frenetic full court press to find something, anything on the current president or any of his advisors that might rise to the level of high crimes and misdemeanors. Negative, suspicious, “gotcha” coverage is shown to be in the mid to high ninety percent range across media outlets. They’re calling for IMPEACHMENT, from the halls of Congress to the nightly news, to the pages of the leading newspapers. CNN’s homosexual-dominated prime time panels have charged and convicted the Trump administration of “collusion” with the Russians to steal the election and a cover-up to hide the “collusion.” It’s Watergate all over again they say, except much worse, as Carl Bernstein insists regularly. The president is guilty of obstruction of justice for having fired former F.B.I. director and full time drama queen James Comey. Everyone insists that was done to run the “Russian collusion” investigation off the tracks. Despite broad agreement that Comey clearly overstepped his authority by deciding that Hillary Clinton would face no charges to do with the long list of broken laws, making a judgment that was not his to make, the chattering class is dead sure he was fired to derail an investigation leading to impeachment. That would seem to have been just cause for his dismissal right there. Even the president’s defenders haven’t seemed to come up with this obvious conclusion. But now there’s an Independent Council, or Special Prosecutor on the job, appointed by the Trump Department of Justice by the handy, dandy Deputy Attorney General. Such a thing never happened in relation to any of the scandals that hung over the former president or his Secretary of State, Hillary Clinton. It looks as though this investigation in search of a crime will hang over the Trump administration throughout the upcoming Summer and well beyond. And who knows? There’s bound to be some conflicting testimony by someone, resulting in accusations of perjury at the very least. For the Special Prosecutor to come up with nothing would look like a failure on his resume´, and that would never do. The ride looks too wild to be on, but here we go. As each week passes the news just continues to highlight the depths to which political discussion has sunk in most places around the world. But particularly in those nations identifiably, if you look at the evidence, related to the tribes of the ancient nation of Israel. What’s that you say? Aren’t the Jews Israel – ancient and modern?